As a mom, I am always looking for family activities that are educational or cultural but still FUN! So, I am very excited to check out the new Overground Project skateboard park, opening just in time to entertain your kids alllllllllll Summer long! The Overground Project is a new private skate park located in the Cedars District on Ervay St. in South Dallas. The Overground Project houses different businesses that all give back to Texas Skateboarding, the local youth, the arts, and the Dallas Community. Overground Project consists of a private skate park, skateboard production company, online skateboard magazine, foundation, and event space. Partners include legendary pro skateboarder Mike Crum, and life long skateboarder and master carpenter Oliver Bradley. This Saturday they are hosting a HUGE skate event. Meet skateboard legends; Christian Hosoi, PLG, Jake Brown, Pat Duffy, Rune Glifberg and more. It will be a great day of music, art, skate, food and fun. A 50 foot vertical ramp was built just for the event so you are sure to see some awesome stunts. Tickets are just $!5 and can be purchased here. The event is called BONELESS ONE a tribute to Jeff Phillips. Dead at age 30 of a self-inflicted gunshot wound in 1993, Phillips was a Texas icon who came up the skateboarding circuit in the mid-80s. He was a pro for several skateboarding companies including Sims, Zorlac and Life’s A Beach. 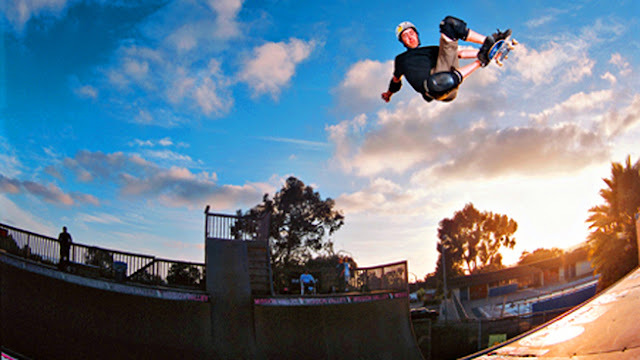 Phillips mentored countless skaters and was known for his fearless “burly” approach to the vert ramp. 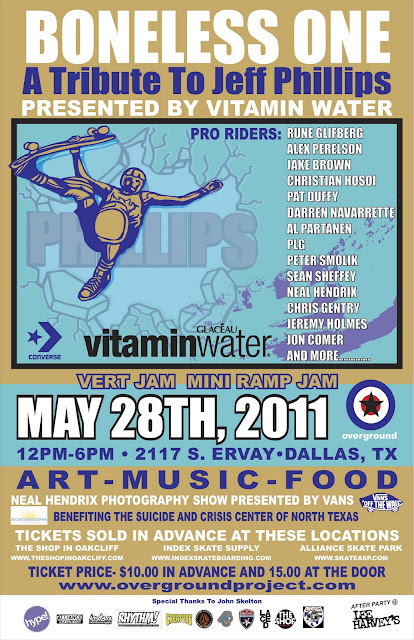 All proceeds from Saturday's event will benefit the Suicide and Crisis Center of North Texas.